Here we are, in the heart of winter, and cold and flu season is in full swing. As a follow-up to my article on acupuncture as an alternative to the flu shot, here are a few acupuncture tips to help relieve the discomfort caused by these conditions. 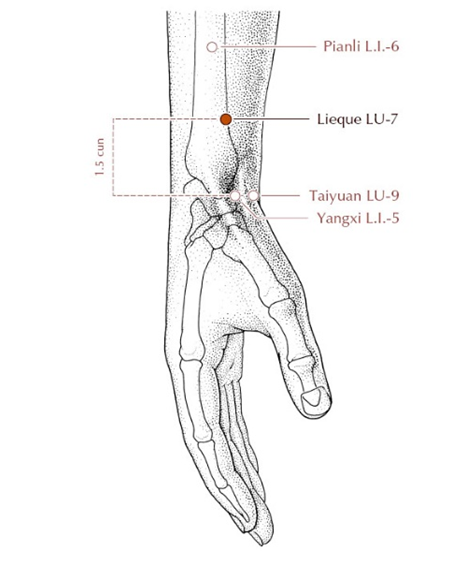 Acupuncture points can be stimulated in a number of ways other than using needles. The following are some useful points that can be stimulated by simply applying finger pressure in order to help fight colds and flus. These few suggestions will undoubtedly provide you with some relief this winter. A master point for boosting the immune system, it is especially interesting for people who are susceptible to upper respiratory tract infections. In acupuncture, the kidney plays the role of receiving energy and delivering it to the lungs, that is, distributing air (or the lung’s energy) throughout the body. When this collaboration between lung and kidney is disrupted, symptoms such as coughing and shortness of breath can occur. This can also lead to fatigue, since the body is not well oxygenated. Kidney 27 is useful in helping relax the thoracic region and ease respiration. 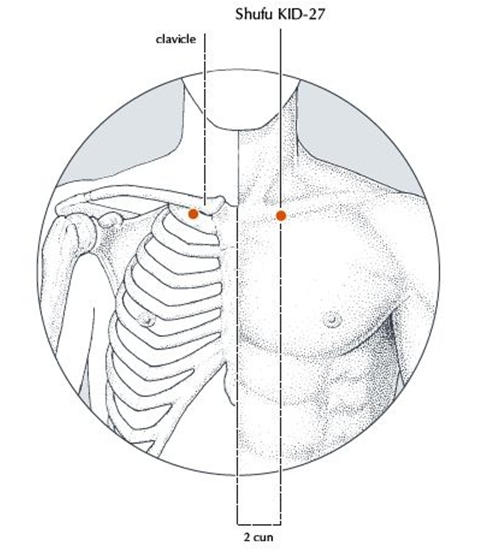 It is an easily accessible point located below the clavicle, near the sternum. With the fingers, you can feel a small depression at this spot. Massage or firmly tap the points for one to two minutes. They can be stimulated at the same time, or one after another. Large intestine 20 or Ying Xiang translates into English as “Welcome Fragrance.” It is a reliable point for opening the sinuses and nasal passages. It is undoubtedly the master point for all types of nasal congestion. Colds, sinusitis and seasonal allergies can all benefit from stimulating this point. It is located in the upper part of what is known as the nasolabial groove. 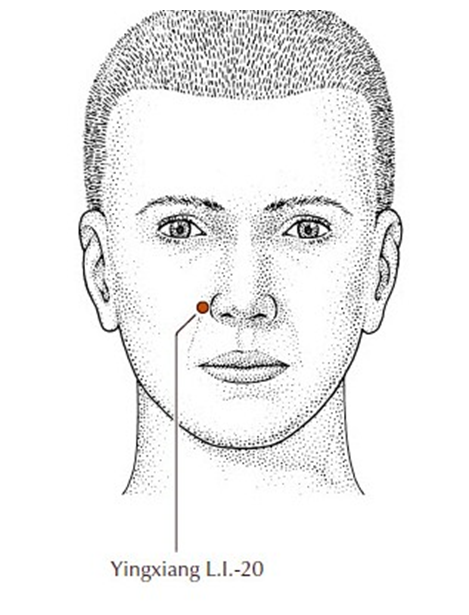 In order to stimulate these points, massage the area using a circular motion or firmly press for one to two minutes. If only one side is congested, simply stimulate that side. Lung 7 is a key point for alleviating colds and flus this winter. It helps relieve a number of common flu symptoms such as cough, sore throat, chills and fever, congestion, runny nose, and even related muscle stiffness and headaches. It is located two finger breadths above the wrist crease. The classic technique for finding lung 7 during self-massage is to interlock the thumb of each hand. The tip of the index finger placed on the styloid process of the radius arrives just above the point. More specifically, the point is located between the two tendons that can be palpated in this position. Once again, stimulate one to two minutes and repeat as needed, until the symptoms are relieved. Now you’re equipped with new tools to tackle winter. Enjoy the season! Feel free to visit our website to find out about our various locations or call us at 514-787-1818 to make an appointment with our team.